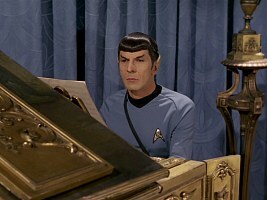 Classical music of European origin can be heard in Star Trek episodes and movies on various occasions. 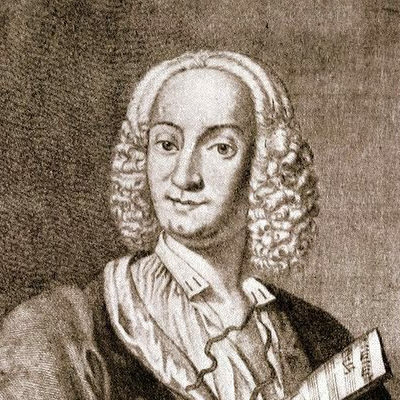 The following list contains all pieces that we could identify, ordered by the name of the composer. All music is either performed by the characters or it is a recording played by the computer. Background music is not taken into account. Notes on audio files We have included a public domain or Creative Commons licensed recording wherever one was available. The ogg files can be played in many browsers with HTML5 support. The audio files are stored in a password-protected directory. You can start all players and/or download all ogg files after logging in just once, with user name "guest" and Riker's middle name as password (case-sensitive). Password enquiries and complaints about the password choice will not be answered. Note that some browsers may have "enhanced" security settings that will not display the password hint of the directory (Chrome) or that will not start the player and only allow to download the ogg files (IE). 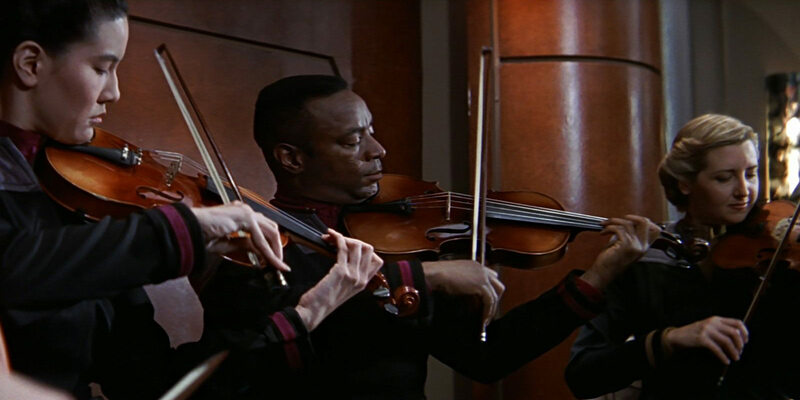 Concerto for Two Violins, Strings and Continuo in D minor ("Bach Double"), BWV 1043 First movement (Vivace) We can hear a short passage near the end of the first movement when Picard puts on his headgear again after talking to Geordi, and re-enters the concert room in "Star Trek: Insurrection". 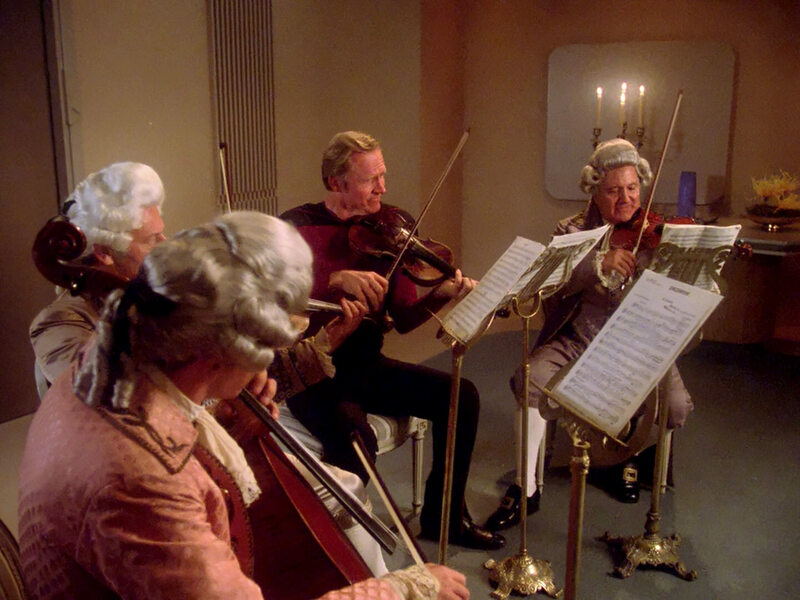 Third Brandenburg Concerto, BWV 1048 First movement (Allegro) Data listens to Bach's Third Brandenburg Concerto (and three more pieces) in order to analyze its aesthetics in TNG: "A Matter of Time". 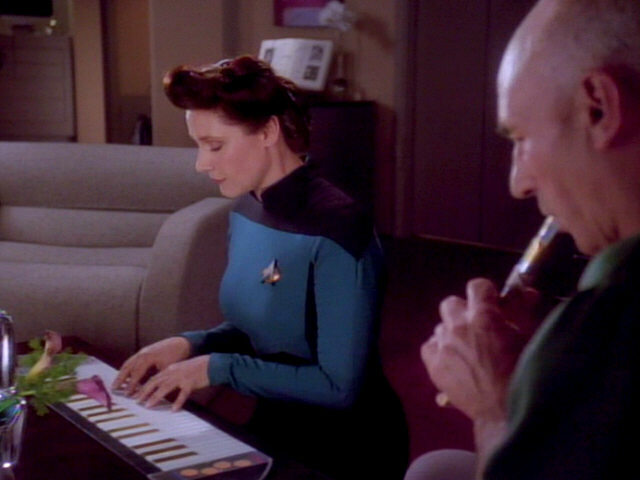 In TNG: "Lessons", Captain Picard (Ressikan flute) and Nella Daren (Mataline II piano) play the first movement (Allegro). They soon decide to switch to something simple, "Frère Jacques". 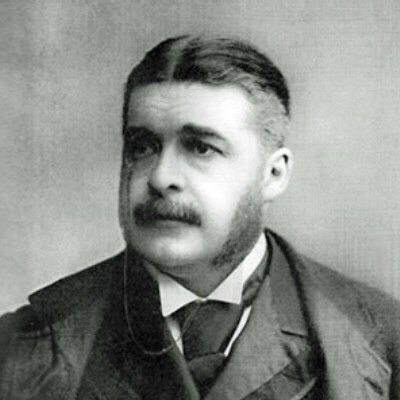 Piano Sonata No. 14 in C-sharp minor "Quasi una fantasia" (Moonlight Sonata), Op. 27 No. 2 First movement (Adagio sostenuto) Nella Daren plays a small excerpt of the first movement on her Mataline II piano in a Jefferies tube in TNG: "Lessons", before Picard changes to the Ressikan tune. 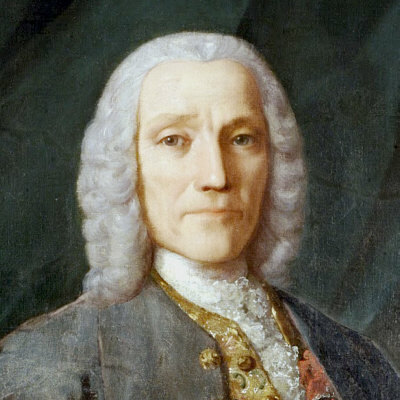 Piano Sonata No. 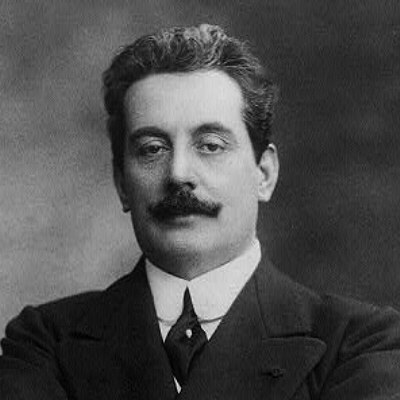 8 in C minor ("Pathétique"), Op. 13 First movement (Grave - Allegro di molto e con brio) The computer plays only the first few notes of the first movement in "Star Trek: Insurrection". 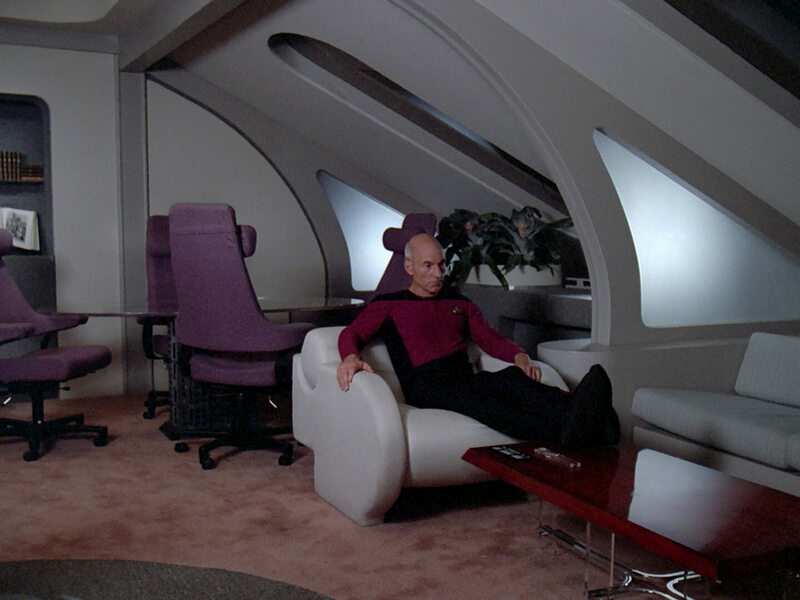 The "rejuvenated" Picard is not content with the music choice and switches to a mambo. Symphony No. 6 in F major ("Pastoral"), Op. 68 First movement (Allegro ma non troppo) - Erwachen heiterer Gefühle bei der Ankunft auf dem Lande ("Awakening of joyous feelings upon arrival in the country") Geordi La Forge listens to the first movement of Beethoven's Symphony No. 6 in a shuttlepod while en route to Risa in TNG: "The Mind's Eye" when suddenly the Romulan Warbird shows up. Symphony No. 9 in D minor, Op. 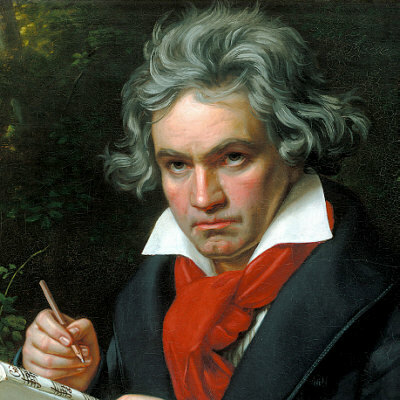 125 Second Movement (Molto vivace) Data listens to Beethoven's Symphony No. 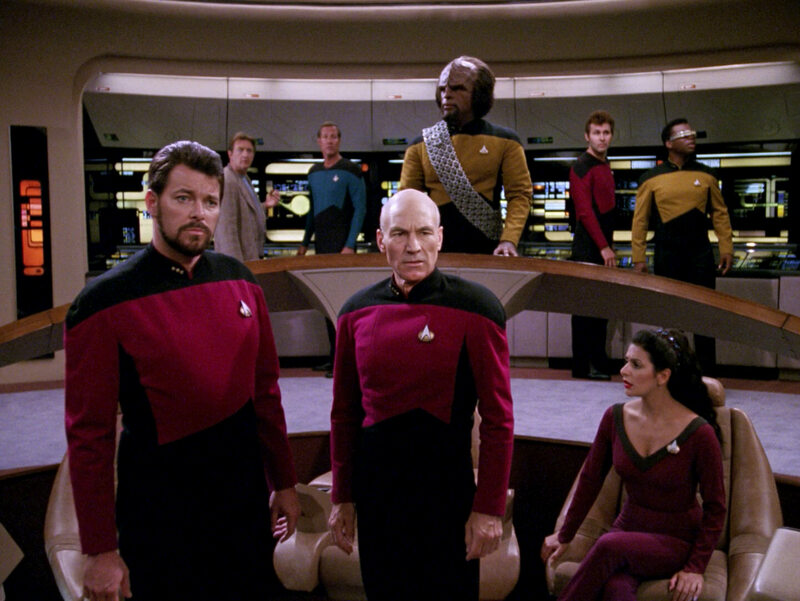 9 (and three more pieces) in order to analyze its aesthetics in TNG: "A Matter of Time". 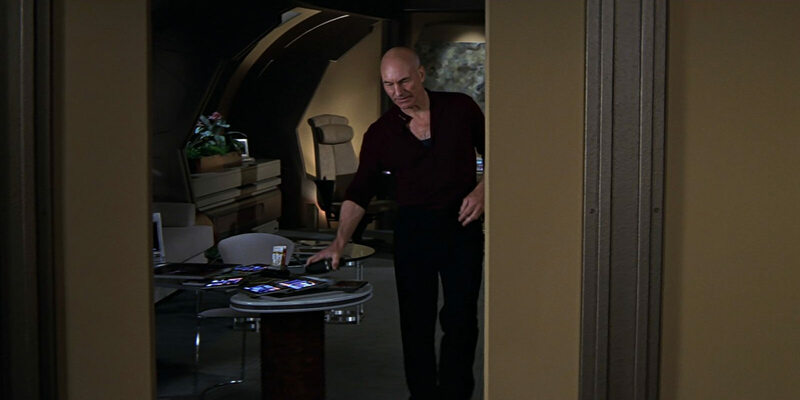 Les Troyens Vallon Sonore Captain Jean-Luc Picard listens to the aria in his ready room during the Battle of Sector 001 in "Star Trek: First Contact", so loud that his tea cup shakes. 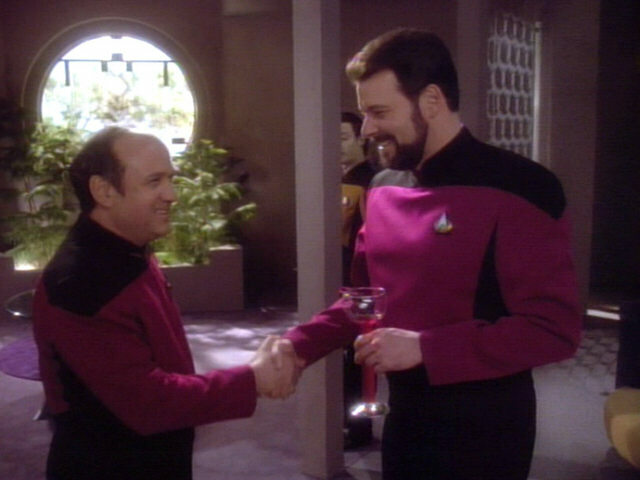 Riker mistakenly identifies the piece as "Bizet". I once wandered singing, alas! O mighty sea, the child of Dindymus. From the fires of the day, alas! 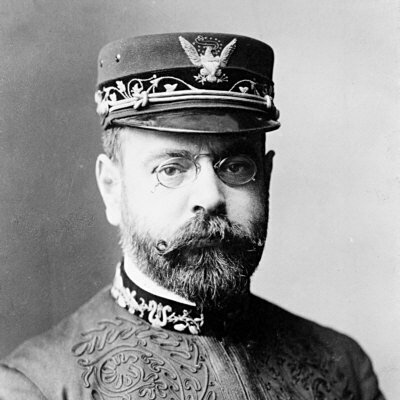 Clarinet Sonata No. 2 in E-flat major, Op. 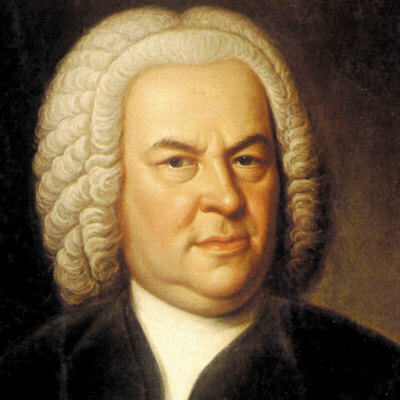 120 First movement (Allegro amabile) Harry Kim is practicing the first movement of Sonata No. 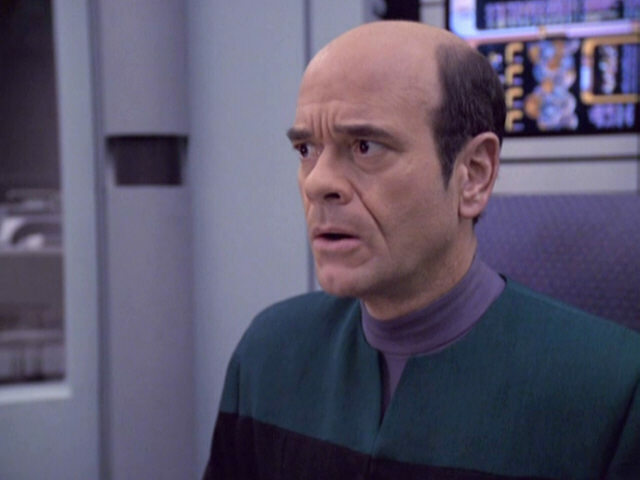 2 in VOY: "Tuvix" when he receives a call from the Doctor. Hungarian Dance No. 5 in G minor - Geordi La Forge's "Moonlight on the Beach" holoprogram features a gypsy violinist playing Brahms's Hungarian Dance No. 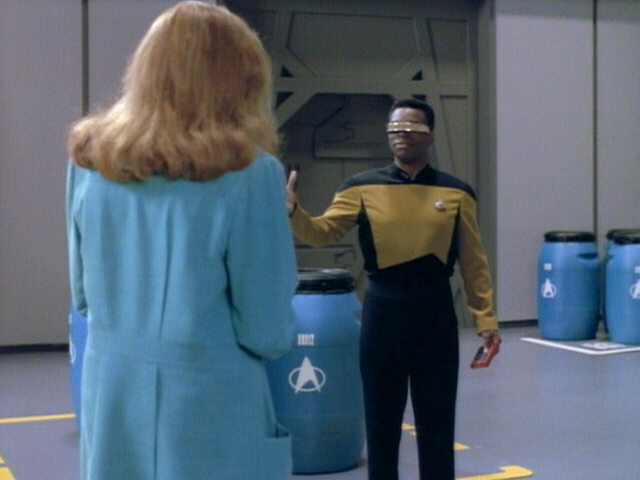 5 in TNG: "Booby Trap". 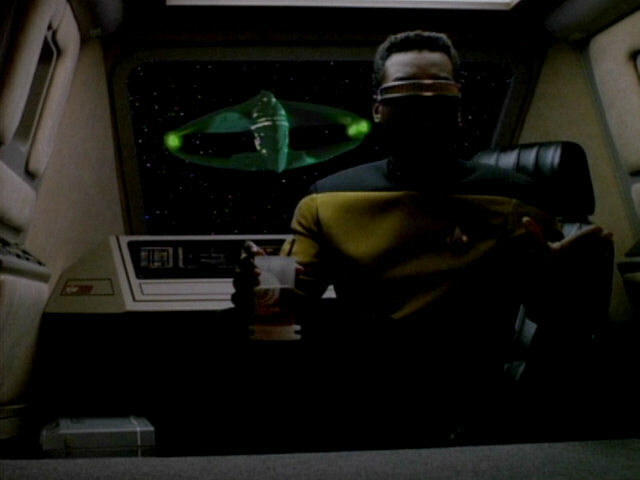 Later in the episode Geordi will encounter another Brahms on the holodeck. Intermezzo No. 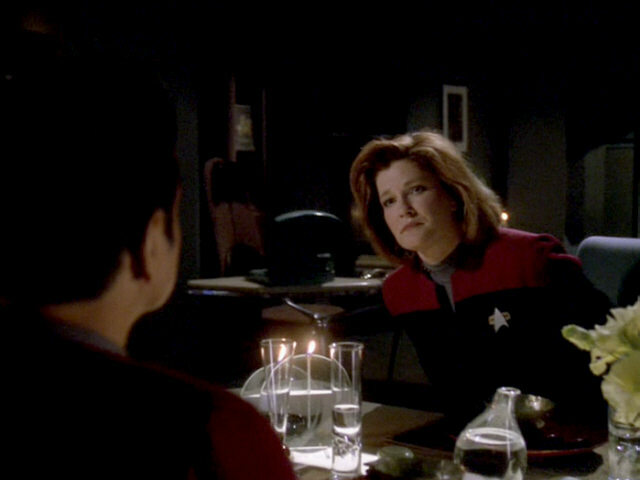 1 in E-flat major, Op.117 First movement (Andante moderato) Janeway chooses the piece as dinner music before having a dinner with Chakotay aboard USS Voyager in VOY: "Timeless". String Sextet No. 1 in B-flat major, Op. 182 Second movement (Andante, ma moderato) The second movement of the sextet is performed (by a quartet!) in honor of Ambassador Sarek aboard the USS Enterprise-D in TNG: "Sarek". 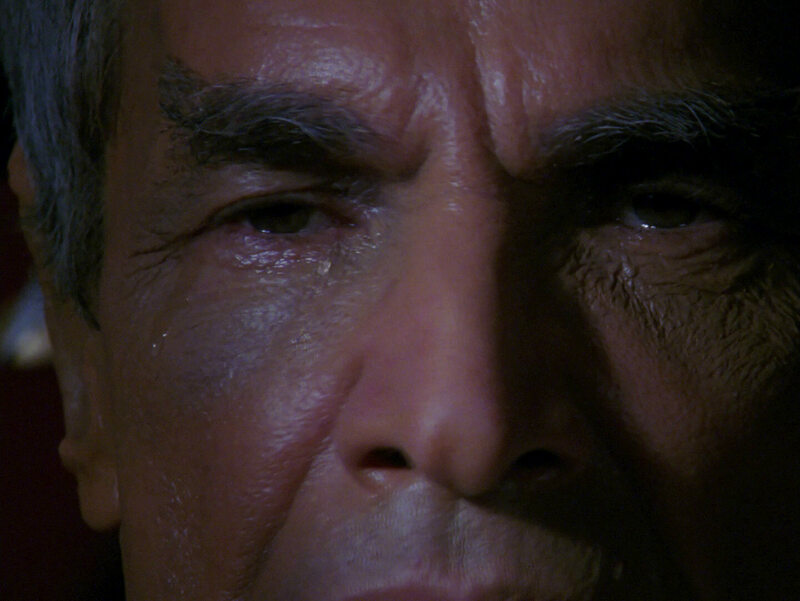 This is the music that brings a tear to Sarek's eye. 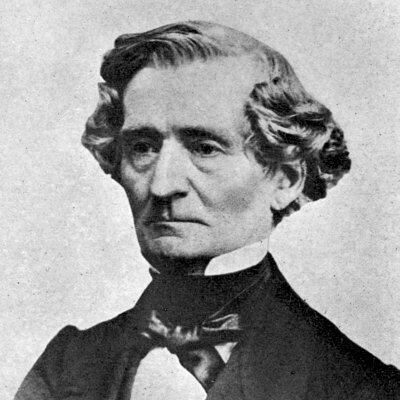 Variations on a Theme of Paganini, Op. 35 Book 2, variation 13 In TNG: "Galaxy's Child", Geordi La Forge wants to impress Leah Brahms, who is about to visit him in his quarters. 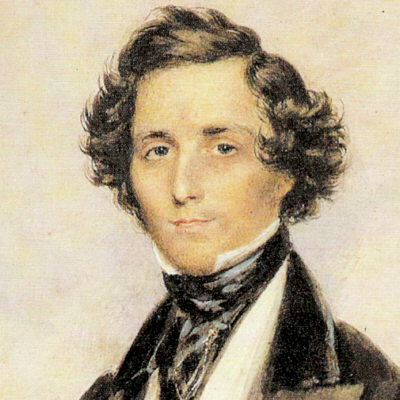 He asks the computer for "Brahms, a piano etude", and the computer plays the Variations on a Theme of Paganini (book 2, variation 13). Fortunately he decides that the idea of playing Brahms is corny. 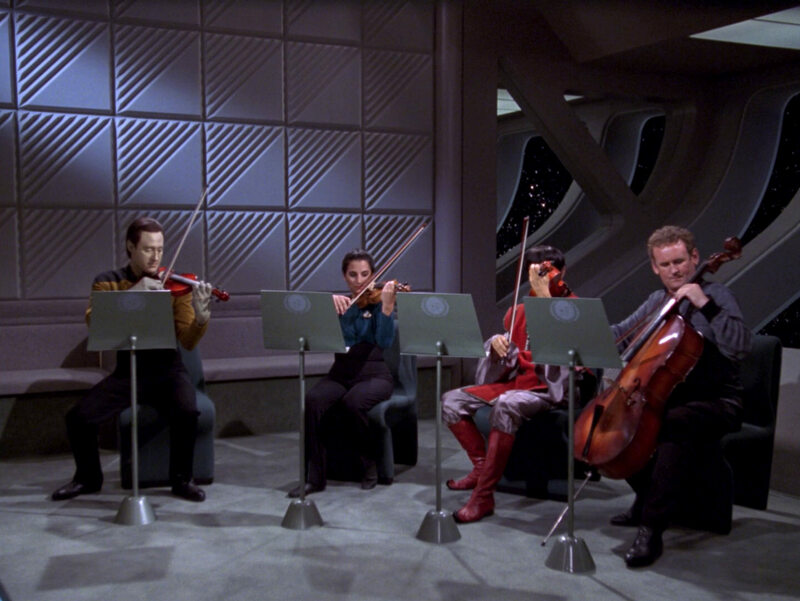 Barcarolle in F-sharp major - Seven of Nine chooses the piece for a rendezvous with the holographic Chakotay in VOY. "Human Error". Nocturne No. 1 in E minor, Op. posth. 72 - Seven of Nine plays this piece on the piano on the holodeck in VOY: "Human Error", at the very beginning of the episode. Prelude No. 4 in E minor, Op. 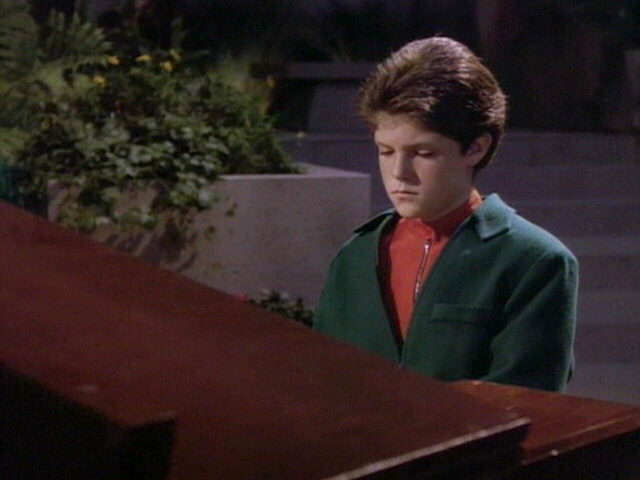 28 - Matthew, a boy living in the colony of Moab IV, performs the piece during a visit of the USS Enterprise NCC-1701-D in TNG: "The Masterpiece Society". Trio for Violin, Violoncello and Piano in G minor, Op. 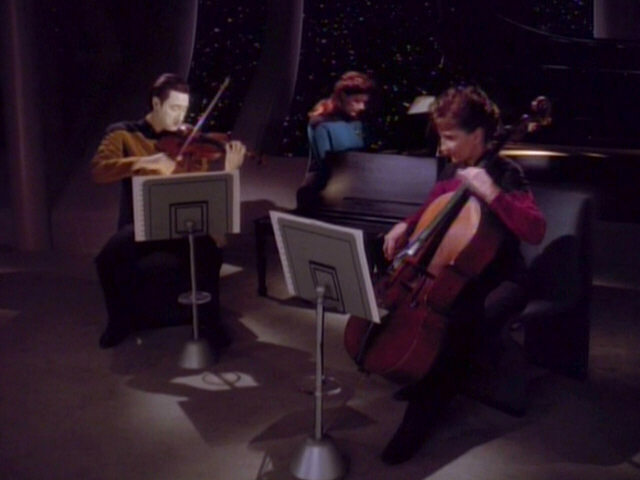 8 First movement (Allegro con fuoco) The piece is performed by Data (violin), Nella Daren (piano) and Ensign Cheney (cello) aboard the USS Enterprise-D in TNG: "Lessons". Rondine al nido First stanza The EMH performs this song during his last concert on the Qomar homeworld in VOY: "Virtuoso". He is interrupted by Tincoo who presents her "improved" holographic matrix, "designed specifically to extend the range of humanoid vocal capabilities". Monti e mare essa varca per tornar. Speri invano ma non torni più. Speri invano ma non torna più. Monti e mare tu non varchi per tornar. Has returned at almond blossom time. It crosses mountains and sea to return. You hope in vain but it returns no more. Drunk on light and air. You do not cross mountains and sea to return. You have fled and return no more. The Slavonic Dance No. 8, Op. 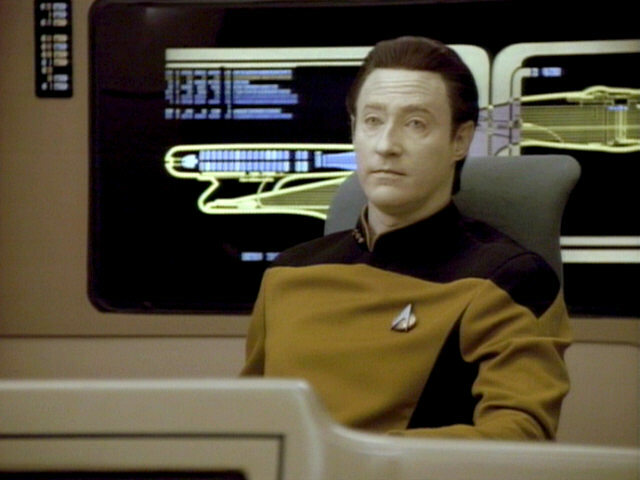 46 - When Data is hooked up to the Enterprise computer in TNG: "A Fistful of Datas" his files replace many other personal files. 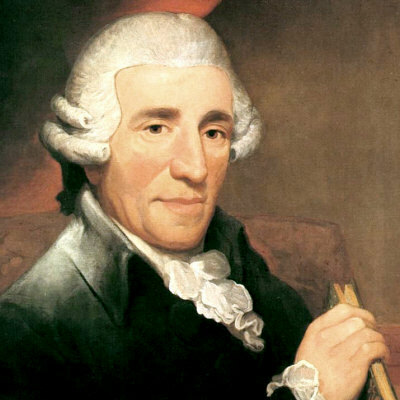 Picard's Mozart trio is partially overwritten by the Slavonic Dance No. 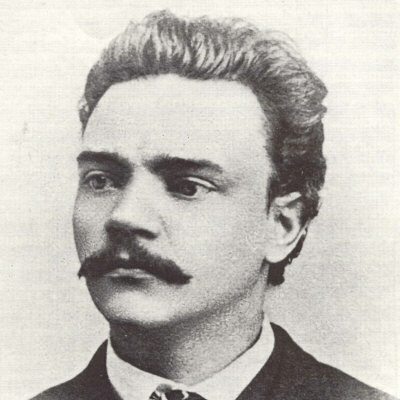 8 by Dvořák. 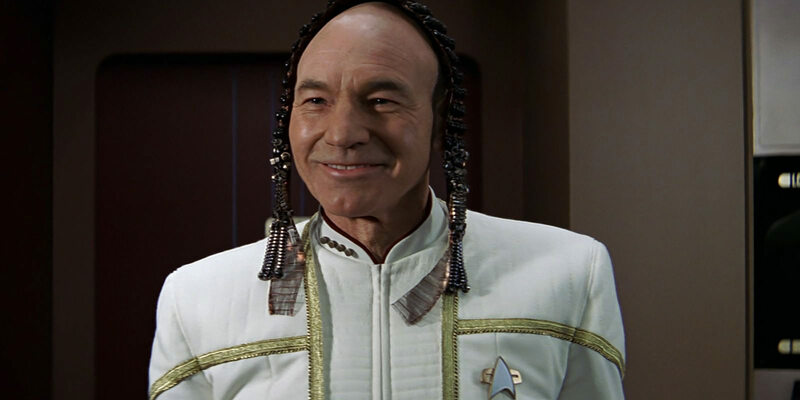 HMS Pinafore A British Tar In "Star Trek: Insurrection", Picard selects the song to distract the malfunctioning Data, chasing the android's scout ship in the atmosphere of the Ba'ku homeworld. Picard encourages the reluctant Worf to sing with him. And his fist be ever ready for a knock-down blow! Or the tang of a tyrant tongue! And this should be his customary attitude, his attitude, his attitude, his attitude. The Pirates of Penzance I Am the Very Model of a Modern Major-General While working in a cargo bay, Beverly persuades Geordi to try the Major-General's song. He just sings the first two lines. Shortly afterwards, a quantum filament strikes the ship. Passacaglia in G minor for Violin and Viola on a Theme by Georg Friedrich Händel (from Harpsichord Suite in G minor, HWV 432) - Data (violin) performs the Passacaglia together with his "mother" Juliana Tainer (viola) aboard the USS Enterprise-D in TNG: "Inheritance". Juliana's perfect play provides Data with a cue that she is actually another Soong-type android. String Quartet No. 5 in D major ("The Lark"), Op. 64 Fourth movement (Vivace) The fourth movement is played during the reception for the Evora in "Star Trek Insurrection", just after Picard has received the headgear. Symphony No. 1 Second movement The second movement is played over the ship's comm system when Kashyk comes aboard the ship for an inspection in VOY: "Counterpoint". 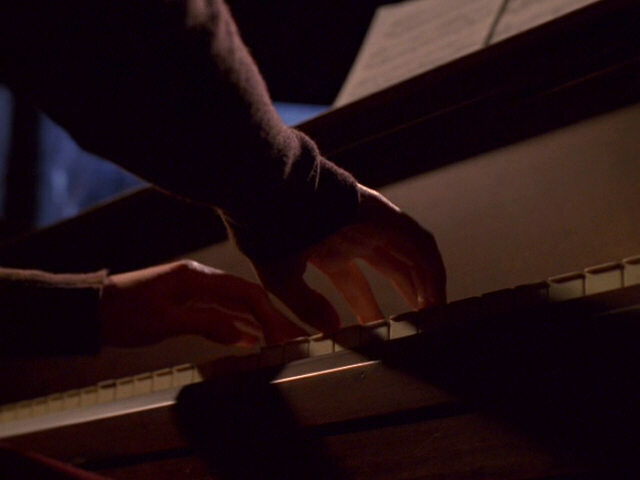 Janeway plays the piece again when she tricks Kashyk in the end. 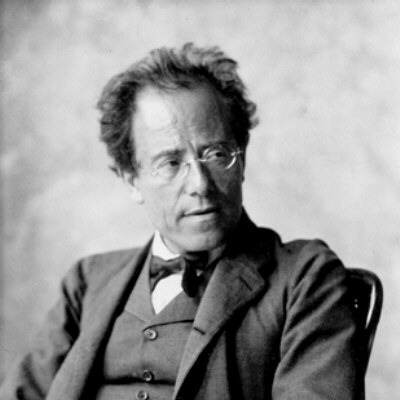 Mahler - Symphony No. 1 - 2. Wedding March in C major, Op. 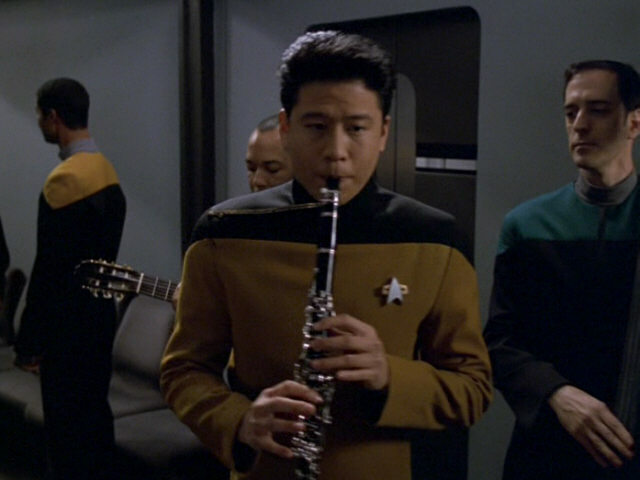 61 - On the biomimetic duplicate of Voyager, Harry Kim performs the Wedding march on the clarinet, on the occasion of the wedding of Tom Paris and B'Elanna Torres in VOY: "Course: Oblivion". Cançó i Dansa / Cancion y Danza No. 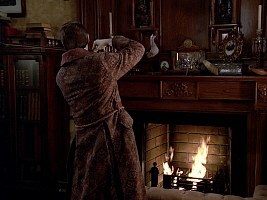 6 - The piece is played in Will and Deanna's quarters in "Star Trek: Nemesis". Deanna tells Will to come to bed, whereupon Riker's image changes to that of Shinzon in her mind. 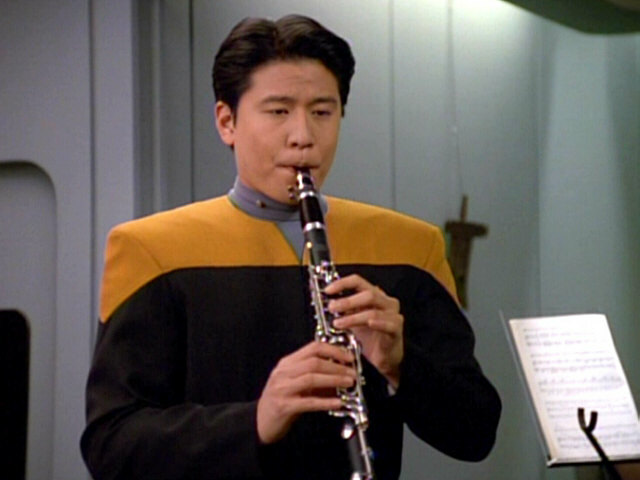 Clarinet Concerto in A Major, KV 622 First movement (Allegro) At the beginning of VOY: "Parturition", Harry Kim is playing the first movement of the concerto in his quarters when Tom Paris enters. Tom asks Harry to play something pessimistic, because he is unhappily in love with Kes. 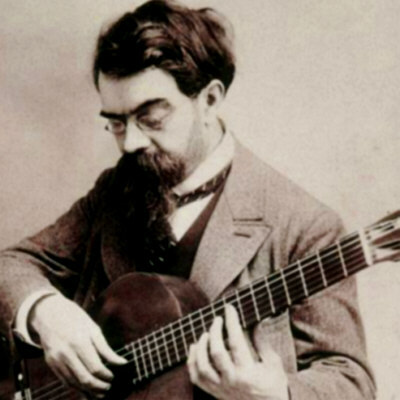 Harry eventually plays a cheerful piece though, which has not yet been identified. Divertimento in Bb No. 2, KV Anh. 229 (439b) - Jean-Luc Picard overlays his own performance on a Ressikan flute against an oboe and cello performance of Mozart's Divertimento, thereby creating the "Picard Mozart Trio". 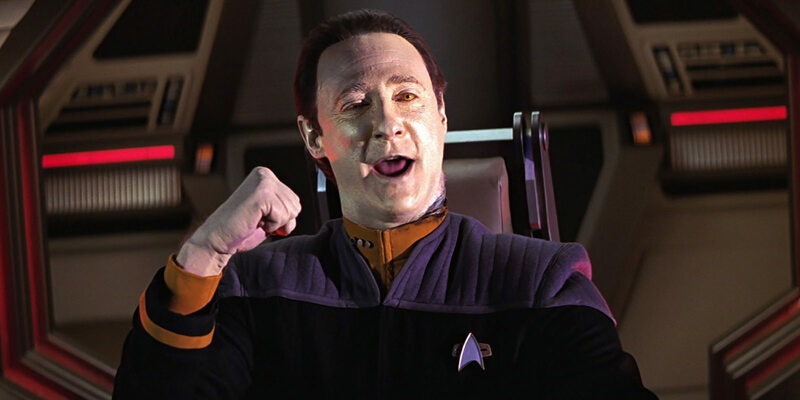 The recording, like many other personal files, gets corrupted in TNG: "A Fistful of Datas" and is partially overwritten by Dvorřák's Slavonic Dance No. 8. 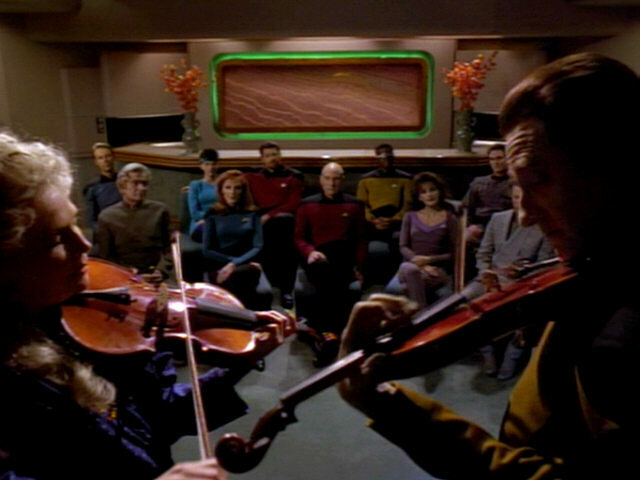 Second movement (Andante) In TNG: "Where No One Has Gone Before", a crew member imagines playing the first movement together with three other musicians, when he is in fact alone in the room. 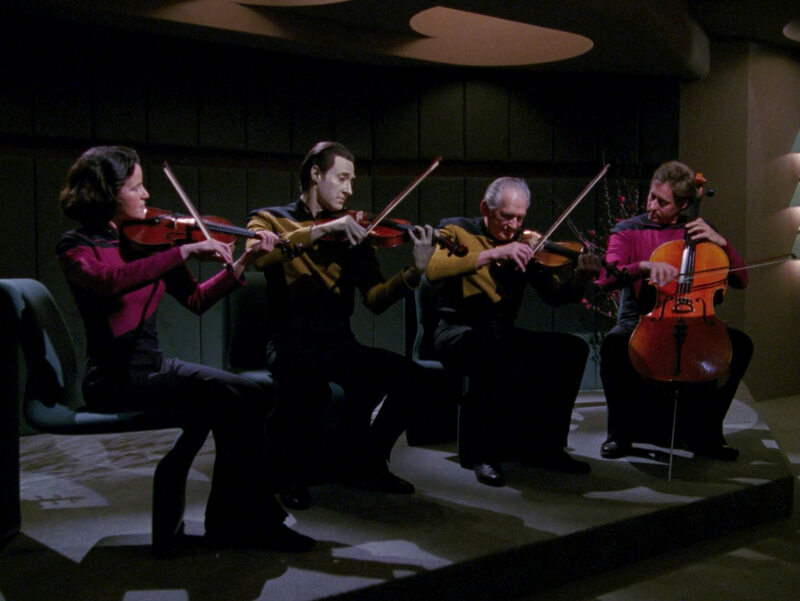 In TNG: "The Ensigns of Command", a string quartet consisting of Data (violin), Miles O'Brien (cello) and two more crew members of the Enterprise-D (violin and viola) can be heard playing the first movement. 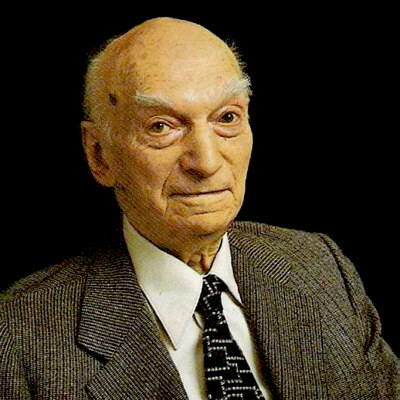 Captain Jean-Luc Picard later listens to an audio recording of the second movement (Andante) that Beverly Crusher made as he wasn't able to attend the concert. Symphony No. 41 in C major ("Jupiter Symphony"), KV 551 First movement (Allegro vivace) Data listens to the Jupiter Symphony (and three more pieces) in order to analyze its aesthetics in TNG: "A Matter of Time". Piano Concerto Number 17 in G major, KV 453 Third movement (Allegretto) The third movement of the piece (Allegretto) is played during the reception on Arkaria held by Commander Calvin Hutchinson when the USS Enterprise-D is undergoing a baryon sweep in orbit of the planet in TNG: "Starship Mine". Piano Sonata No. 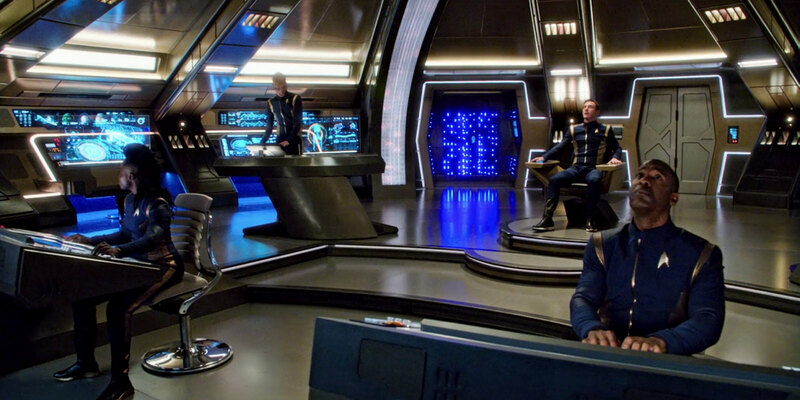 16 in C major, KV 545 First movement (Allegro) Commander Tucker plays the first movement of the piece (Allegro) for the cogenitor in his quarters aboard the Enterprise NX-01 when the two are awaiting the decision about the cogenitor's asylum in ENT: "Cogenitor". String Quartet No. 17 in B-flat major ("The Hunt"), KV 458 First movement (Allegro vivace assai) The end of the first movement can be heard during the reception for the Evora in "Star Trek Insurrection", just after Picard has entered the room to greet the regent. String Quartet No. 19 in C major ("Dissonance"), KV 465 First movement (Adagio - Allegro) The first movement is performed during a Mozart recital in honor of Ambassador Sarek aboard the USS Enterprise-D in TNG: "Sarek". Curiously the musicians skip the adagio and jump straight to the allegro part, almost 2 minutes into the first movement. 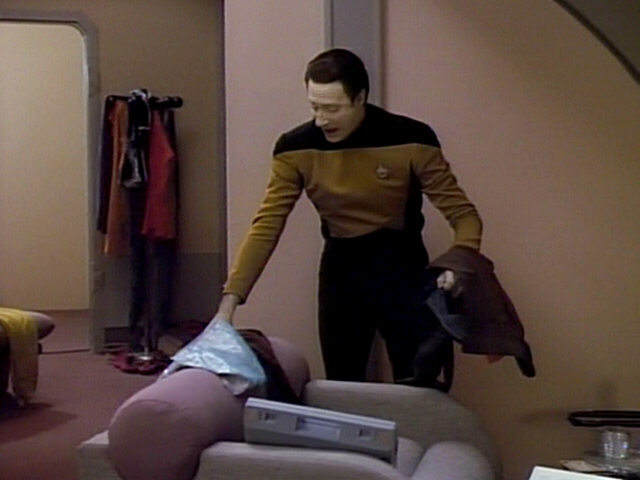 La Bohème Che gelida manina Data sings the first three lines of this aria for Jenna D'Sora in TNG: "In Theory", while cleaning up her room. 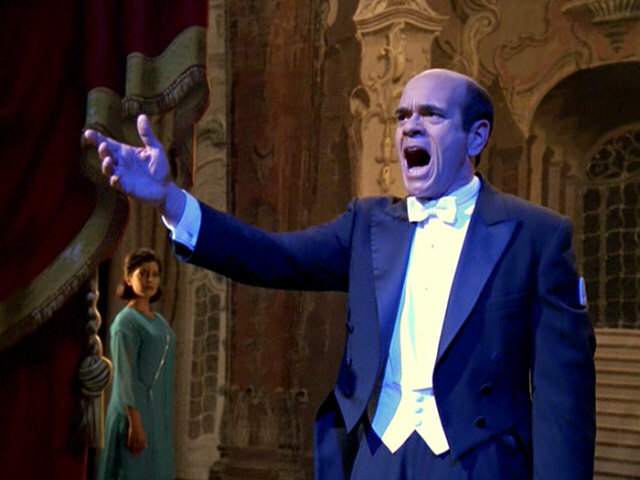 La Bohème O soave fanciulla In VOY: "The Swarm", the Doctor performs this aria together with a holographic reconstruction of the famous 22nd century soprano Guiseppina Pentangeli. When the Doctor gets into an argument with her, he says that he'd consider singing with Maria Callas next time. O soave fanciulla,... ...O dolce viso di mite circonfuso alba lunar, in te ravviso il sogno ch'io vorrei sempre sognar! Ah! tu sol comandi, amor! Fremon già nell'anima le dolcezze estreme, nel bacio freme amor! Oh! come dolci scendono le sue lusinghe al core... tu sol comandi, amore! Che?... Mimì! Sarebbe così dolce restar qui. C'è freddo fuori. Oh, sweet beautiful maiden,... ...Oh, how your face looks, its beauty softly bathed by the gentle moonlight. In you, sweet maiden, I see the dreams of love I'll dream about forever. Ah! Only you alone guide us, Love! Deep in my soul trembles the deepest of passions, etc. Our kisses shudder with love! His gentle sweet words delight me, as they flatter my heart. Love, only you alone guide us! Your friends are still waiting. You're sending me away so soon? What if I came with you? What?... Mimì! It would be nice if we could stay here, outside its cold. I'll stay close by you. Sir, I'll do as you say. Wind Quintet in E-flat major, Op. 88 No. 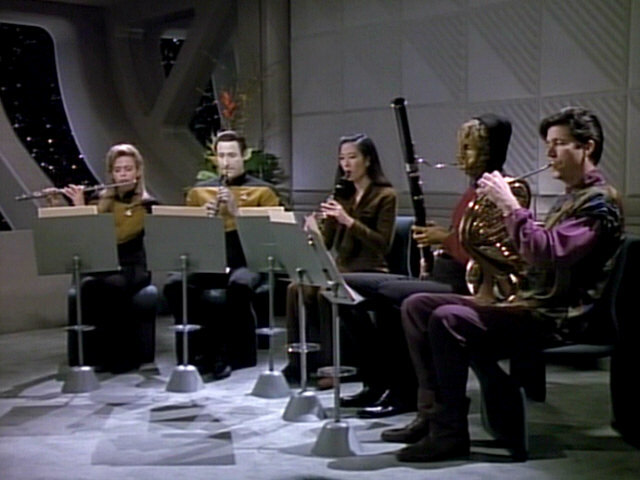 2 Third movement (Andante grazioso) Data (oboe), Jenna D'Sora (flute), Keiko O'Brien (clarinet) and two other crew members (bassoon and horn) perform the third movement in a concert aboard the USS Enterprise-D in TNG: "In Theory". 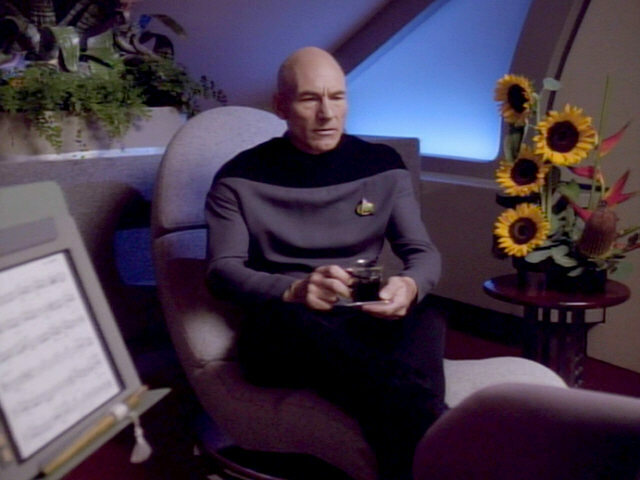 First Gymnopédie - Picard listens to the First Gymnopédie during the auto-destruct countdown in TNG: "Where Silence Has Lease". 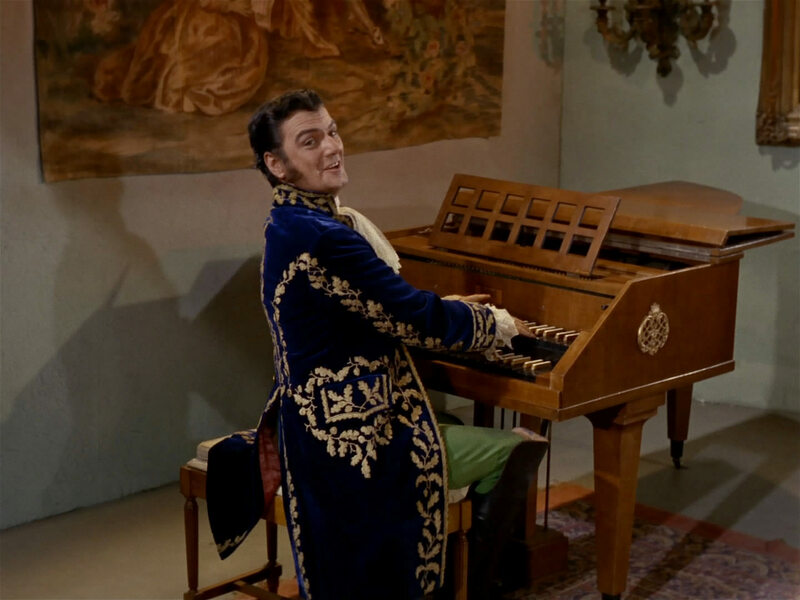 Sonata in C major ("La caccia"), K. 159 (L 104) - Trelane plays the piece on his harpsichord on the planet Gothos, just after the landing party has entered the castle in TOS: "The Squire of Gothos". Kinderszenen (Scenes from Childhood), Op. 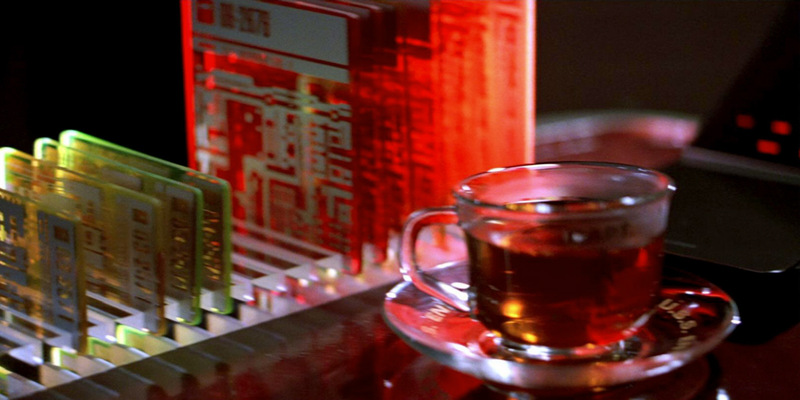 15 First movement - Von fremden Ländern und Menschen (Of Foreign Lands And Peoples) In VOY: "Human Error", the holographic Chakotay listens to Seven of Nine playing Schumann's Kinderszenen, saying it is one of his favorite pieces. He then stops the metronome that is hampering the performance in his view. 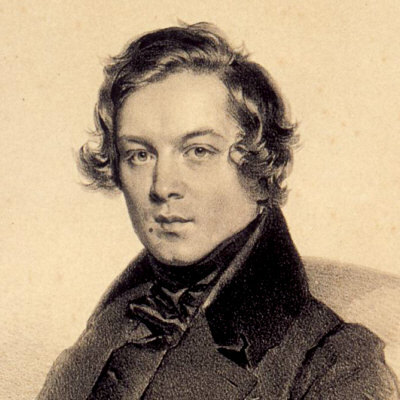 Schumann - Kinderszenen - 1. 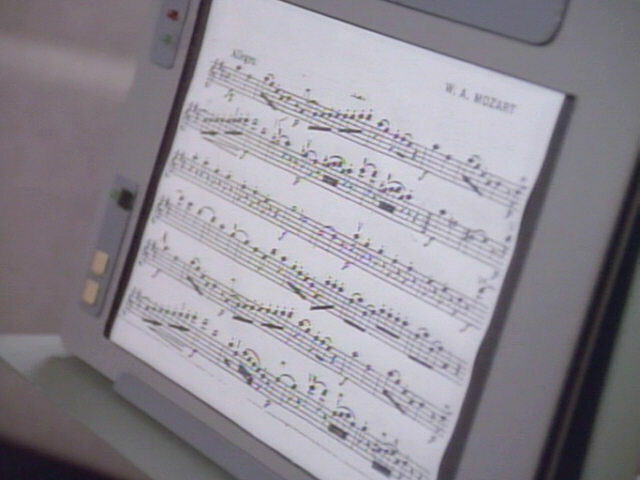 The Stars and Stripes Forever - We can see the sheet music of the piece on the piano in the jazz bar in TNG: "11001001", which is curious because the musicians likely wouldn't play it. In TNG: "Evolution", one of the malfunctions that the nanites create is that all comm channels on the Enterprise-D play "The Stars and Stripes Forever". Frühlingsstimmen, Op. 410 - When the Doctor is trapped in Seven of Nine's body to evade Lokirrim detection in VOY: "Body and Soul", he/she dims the light in the Delta Flyer, replicates some champagne and dances the Frühlingsstimmen waltz ("EMH music file gamma 12") with the Lokirrim Captain Ranek to get close enough to stun him. Rosen aus dem Süden (Roses from the South), Op. 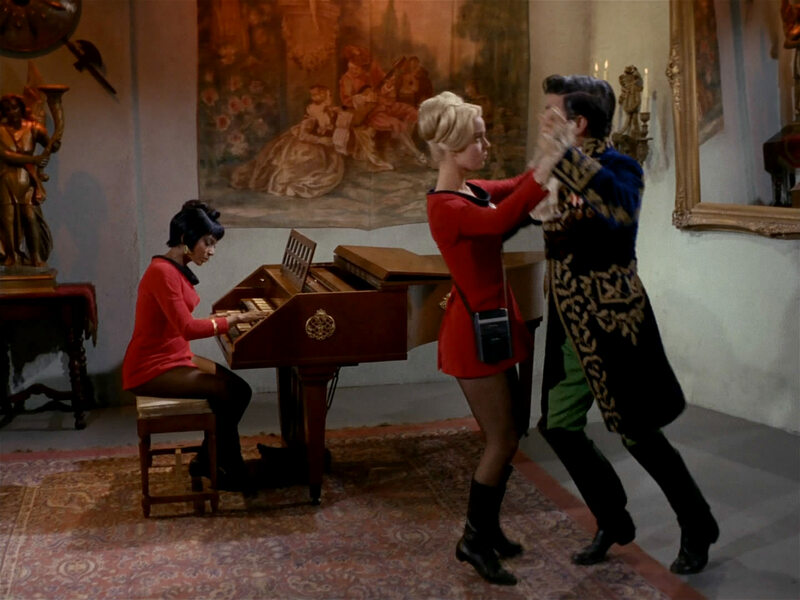 388 - Trelane makes Uhura play the waltz on his harpsichord in TOS: "The Squire of Gothos". An der schönen blauen Donau (The Blue Danube), Op. 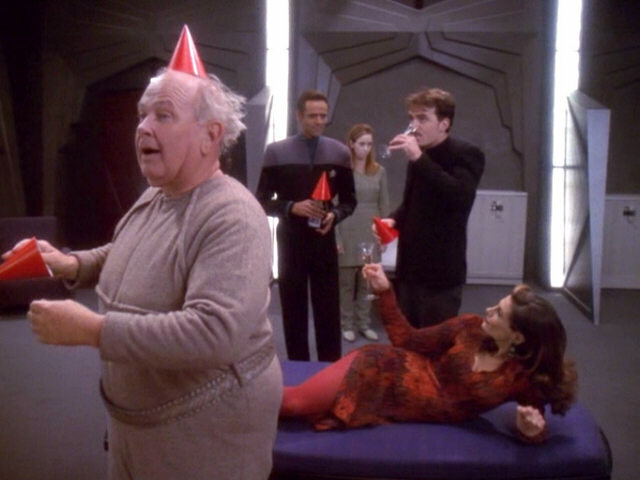 314 - In order to celebrate Captain Benjamin Sisko's approval of taking their analysis regarding the Dominion War to Starfleet Command in DS9: "Statistical Probabilities", the four genetically engineered Humans, Jack, Lauren, Patrick, and Sarina Douglas hold a party with Doctor Bashir. They drink champagne and dance to Strauss's Blue Danube waltz. 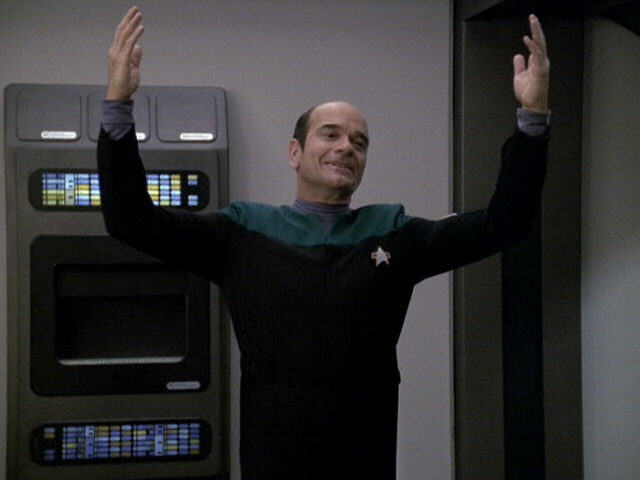 Voyager's Doctor plays the Blue Danube waltz in one of his recitals in VOY: "Renaissance Man". When he and Captain Janeway are abducted by the Hierarchy, the Doctor alters a recording of the waltz so that it would sound out of tune. 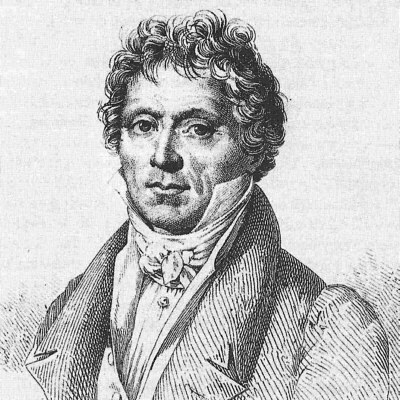 By performing a Fourier analysis, Seven of Nine finds out that the harmonics of the piece have been modified to imitate a warp signature. The crew is able to track the signature and thereby locate the Doctor and the captain. Prelude No. 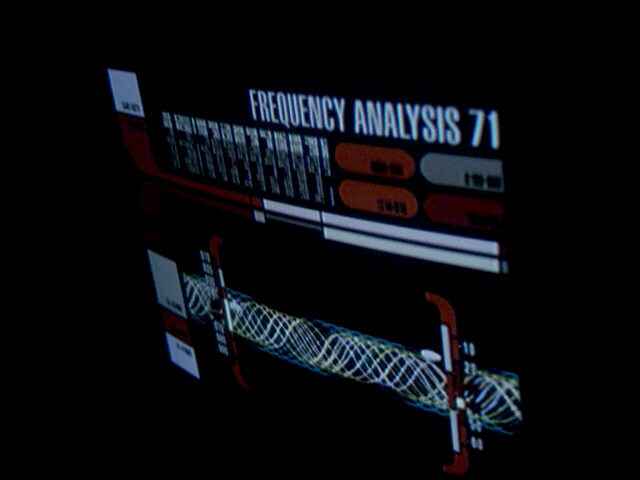 4 in A minor - Data plays this piece on the guitar in TNG: "Silicon Avatar". Symphony No. 4 in F minor, Op. 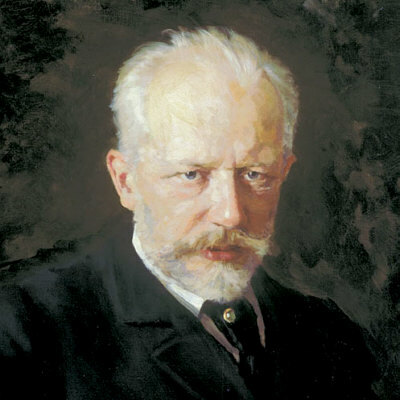 36 Second movement (Andantino in modo di canzona), B flat minor Tchaikovsky's Symphony No. 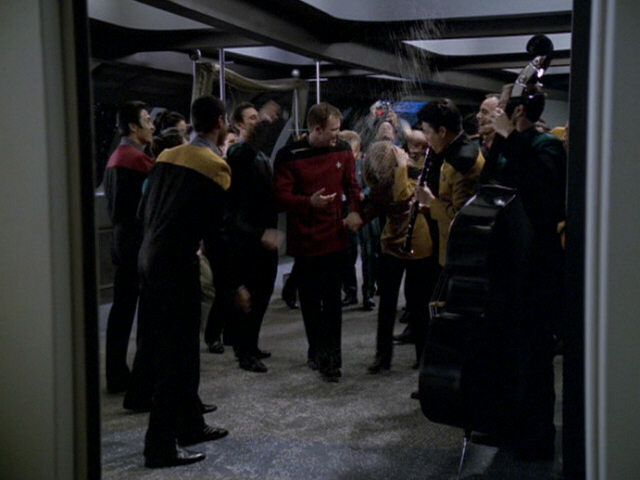 4, second movement, is played in the mess hall when Janeway and Kashyk (who has allegedly defected) are working on finding the wormhole in VOY: "Counterpoint". 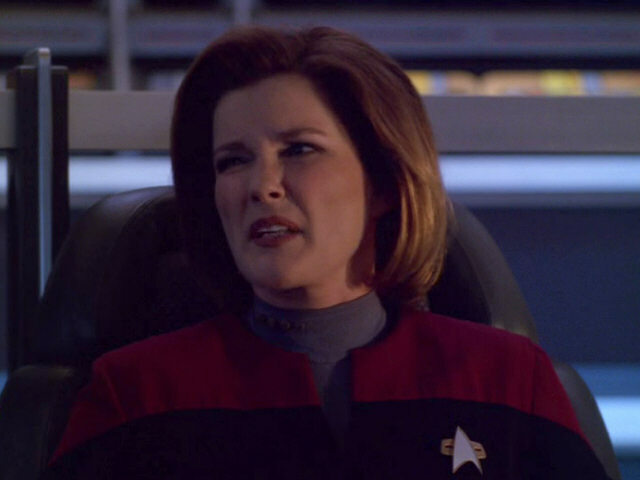 The eponymous counterpoint in the music gives Janeway a cue that the spatial parameters could have a counterpoint in subspace. 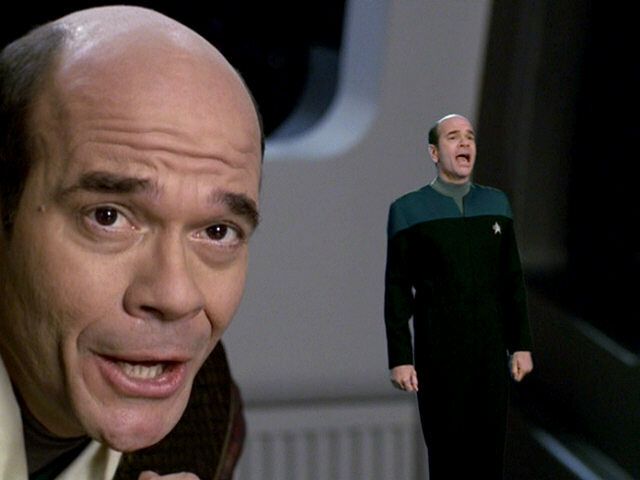 The same piece is played once again in the episode during Kashyk's following inspection, after his return to duty. Rigoletto La donna è mobile Data listens to the aria (and three more pieces) in order to analyze its aesthetics in TNG: "A Matter of Time". 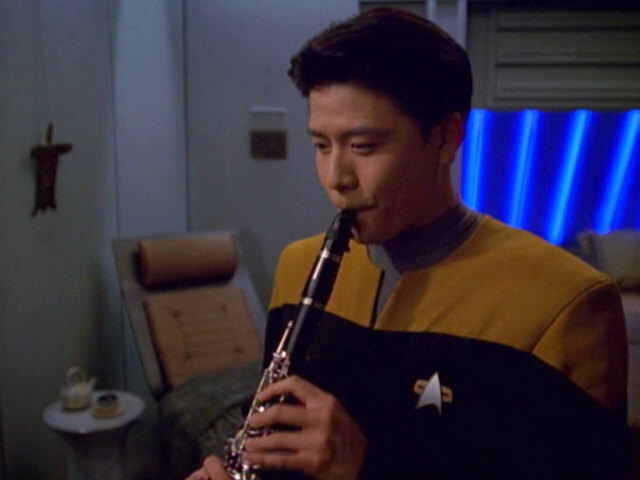 When his daydream algorithm goes awry, the Doctor imagines that he is performing this piece in the mess hall in VOY: "Tinker Tenor Doctor Spy". When Tuvok unexpectedly enters pon farr during the recital, the Doctor sings an altered version while "curing" him. 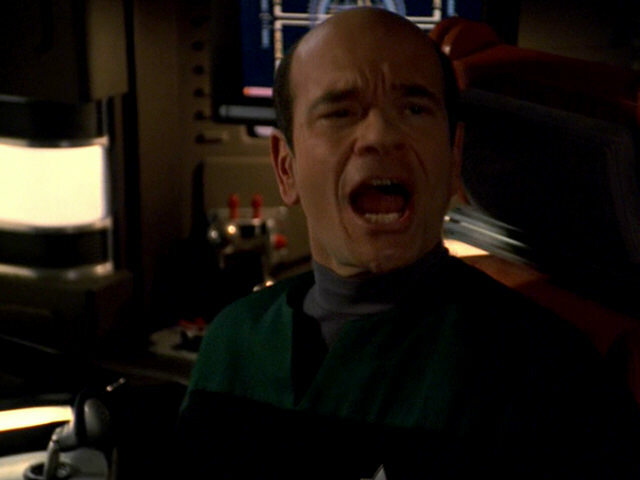 Voyager's Doctor is singing the song in his office, when Seven removes his singing algorithms to prepare him for his transfer to the Alpha Quadrant in VOY: "Life Line". of a sweet kiss! 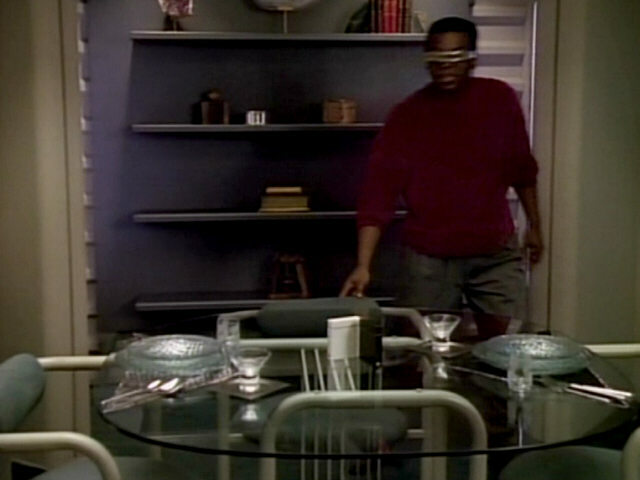 Tuvok, I understand. Rigoletto Questa o quella The Doctor sings this aria during an away mission in the cockpit of the Delta Flyer in VOY: "Renaissance Man". forse un'altra doman lo sara. 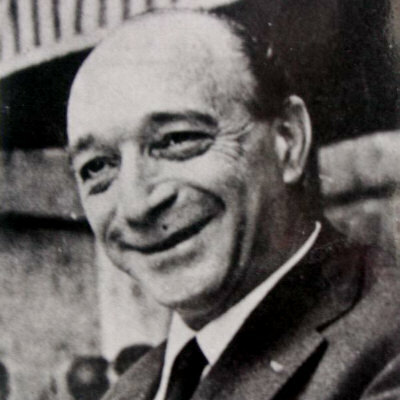 non v'ha amor, se non v'e liberta. none can say, "I am preferred;"
in freedom only does love lie. Rigoletto Veglia, o donna, questo fiore In VOY: "The Void", the Doctor hums the aria in sickbay while treating Fantôme, a member of a species native to the Void, where Voyager is trapped. As Fantôme seems to relax when he hears the song, the Doctor plays the full orchestral version of the aria while treating the injuries. Seven of Nine gets the idea that music may be a way of communication with Fantôme's species. che s’offuschi il suo candor. restore her to her father. Don Carlos Dio, che nell'alma infondere The Doctor performs the aria aboard Voyager for an audience of Voyager crew members and a number of fascinated Qomar in VOY: "Virtuoso". He later gives small holograms of him singing the same song to Qomar admirers, even singing a duet with his small holographic self. Le quattro stagioni (The Four Seasons) - Primavera First movement (Allegro) This piece is played by the Earth probe Friendship One when it contacts the planet Uxal in VOY: "Friendship One". 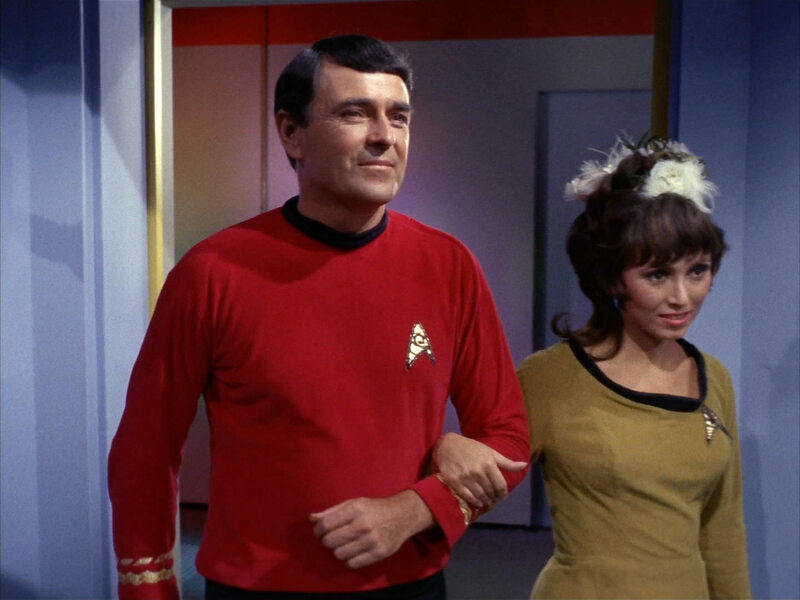 Lohengrin Treulich geführt (Bridal Chorus) The traditional wedding march is played on the wedding of of Angela Martine and Robert Tomlinson aboard the USS Enterprise in TOS: "Balance of Terror". 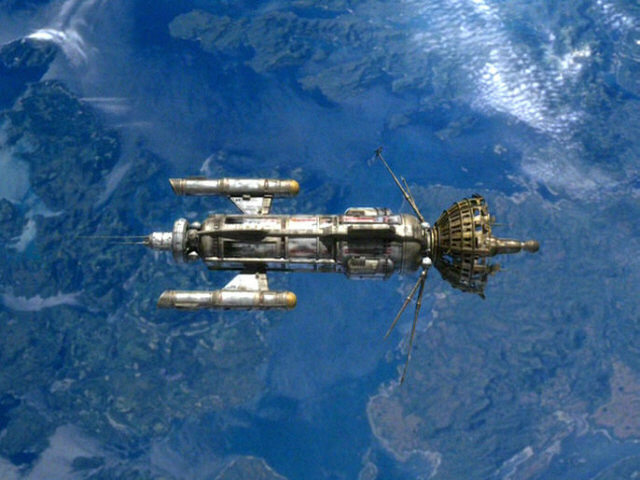 We can also hear the piece in VOY: "Course Oblivion" on the wedding of the biomimetic duplicates of Tom and B'Elanna, here played by Harry Kim on the clarinet and two other crew members (double bass and guitar). 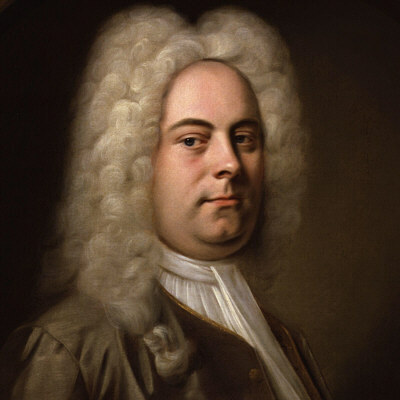 Lohengrin Prelude to Act III Harry Mudd plays this over the comm system in one time loop in DIS: "Magic to Make the Sanest Man Go Mad", just before he enters the bridge of the Discovery to take command. Prelude to Act III encompasses the above bridal chorus in its middle and at its end, but we only hear the beginning in the episode. There are still several pieces of classical music heard in Star Trek that have not yet been identified. Here is a listing of those pieces and any information that could be gathered. The music box melody played by Janet Brooks's music box in TNG: "The Loss"
The piece of piano music that Kathryn Janeway listens to in her quarters while reading La Vita Nuova in VOY: "Latent Image"
The following compositions were created especially for use in an episode and are not classical in a narrow sense. Spock plays a waltz on the piano that he recognizes as an unknown work of Johannes Brahms. Flint, the only inhabitant of the planet, claims that he actually was Brahms (and several other historical figures, including Methuselah, Solomon, Alexander, Lazarus, Merlin and Leonardo da Vinci). 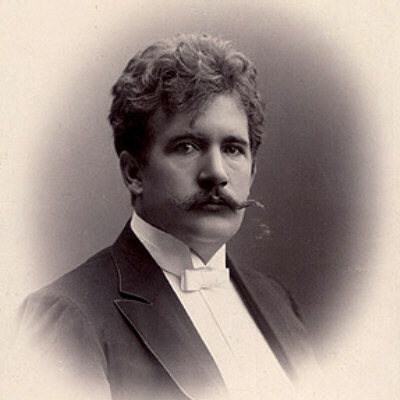 In the real world, the waltz was composed by Ivan Ditmars especially for this episode and is named "Pseudo Brahms Esq.". 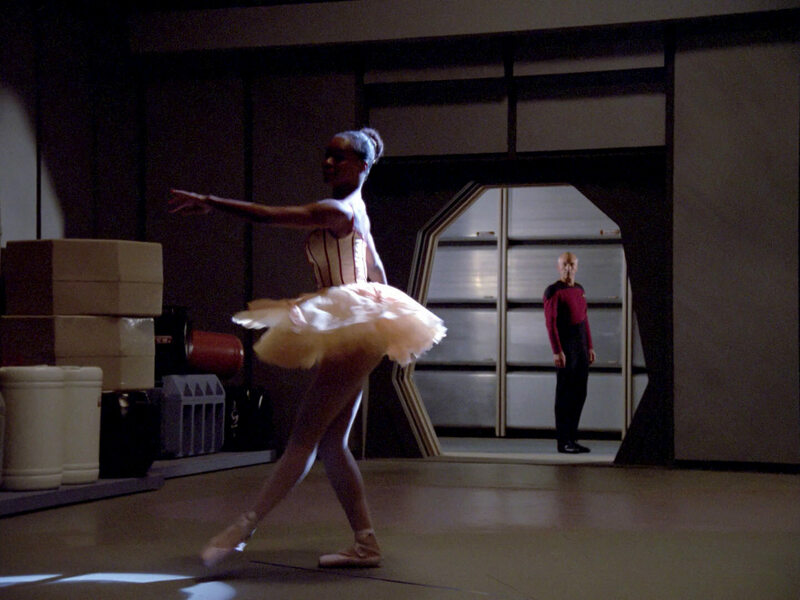 The classical ballet music we can hear when the ensign hallucinates that she dances (and Picard walks by) was composed especially for the episode too. 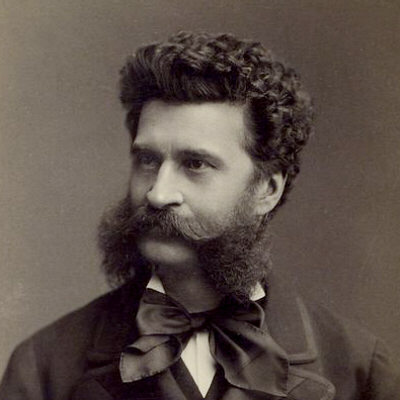 The composer is Ron Jones, and he named it "Waltz of the Chocolate Donut". The violin melody played by Data as Sherlock Holmes on the holodeck at the beginning of this episode was composed by Dennis McCarthy and is called "Sherlock Tones". Parts of the American National Anthem (The Star-Spangled Banner) can be heard in TOS: "The Omega Glory" when the American flag is brought in. Parts of the French National Anthem (La Marseillaise) are played when the crew runs into Q's Napoleonic creatures for the first time in TNG: "Hide and Q". Both pieces are only background music and remain unnoticed by the characters. "Sabotage" by the Beastie Boys is referred to as "classical music" in "Star Trek Beyond". 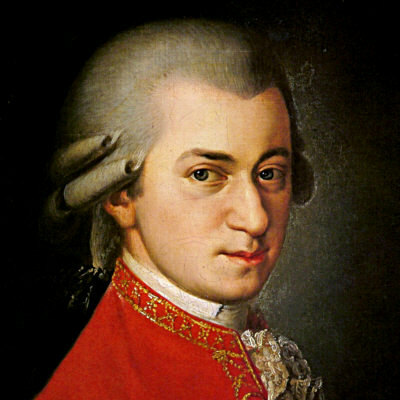 The basic list of classical music comes from Memory Alpha. Most of the screen caps are from TrekCore. 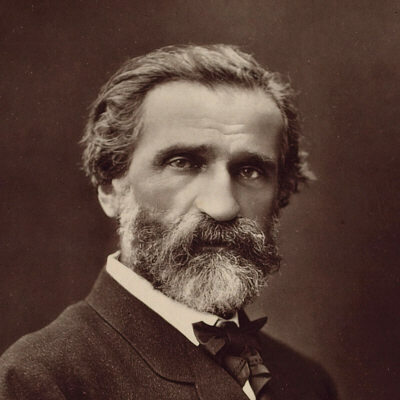 All composer portraits are taken from Wikipedia. This project wouldn't have been possible without the free music archives such as IMSLP, Archive.org, ibiblio.org and Musopen. 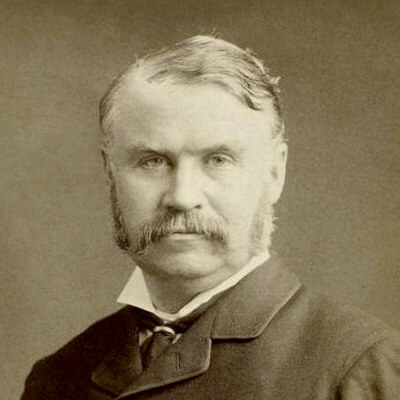 Thanks to Lukas Kendall for the information about the Sherlock Holmes violin composition.